No city in all the world has so many clubs as London. Nowhere have the social, the political, and the literary elements of national life been so closely associated with Clubland as in the me­tropolis of Great Britain. The somber, richly upholstered club houses of today are the outgrowth of the taverns and the coffee houses. They are the lineal descendants of the Mitre and of Jack Straw's Castle, of the pock pits and the gambling hells. Present day Clubland extends in a zig­zag course from the bottom of Waterloo Place along Pall Mall, up St. James' Street, to the middle of Piccadilly. 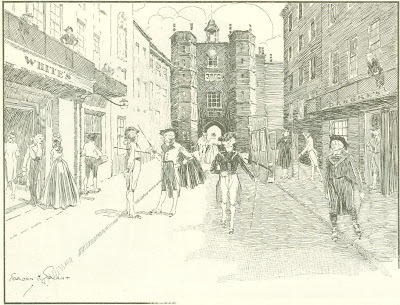 It occupies that quarter of fashionable London through which Don Juan drove on his first arrival in the capital city of England. St. James' Palace and St. James' "Hells." Today those broad streets are flanked by stately buildings, mixed with curious, unpretending edifices—the shops of hatters and of wine merchants, of saddlers and silversmiths, of dealers in ancient sporting prints and of one lonely pawnbroker. Even the tawdry, draggle tailed tavern pushes its beery head out between the most exclusive clubs of modern existence—the bait house of the gentleman's gentleman, el­bowing its way into line with the jealous­ly guarded home of the aristocracy of England. Tankards of ale at six cents a pint can be bought by the lounger from the street corner beneath the very windows of the Reform Club. The prime minister of England, the most noble the Marquis of Salisbury, as he looks out from the drawing room of his town house in Arlington Street, gazes over into the bleary eye of a common public house. St. James', with all of its aristocratic exclusiveness, has more of the curious anomalies of a true democracy than has Fifth Avenue. This district of St. James' gives to the British court its official designation. Every ambassador is delegated to the Court of St. James. Its chapel is the Chapel Royal. Its apartments of state are most magnificently decorated. Made a royal residence by Henry VIII, en­larged by Charles I, and made notorious by Charles II, it stands today a group of offices of court officials, a curious link between the London of the Guelphs and the London of the Stuarts. No monarch has slept in St. James' for generations. 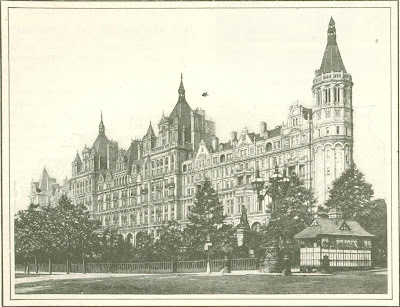 Passing out from this grim and grimy palace, through the famous brick gate of Henry VIII, up the "celebrated emi­nence" of Disraeli's Endymion, one reaches the Clubland of Piccadilly. But the real center of Clubland is Pall Mall. Here stand the greatest clubs known to Englishmen. It is almost im­perial, this thoroughfare. It certainly is historical. The name it bears comes from the old Italian game of "palle malle," a game that gamins still play in sleepy old Italian cities, pounding their palle with the maglia, or mallet. It was the forerunner of our modern rackets, a sort of medieval tennis. It was in­troduced into London by Louise Renee de Querouaille, Duchess of Portsmouth and Aubigny, maid of honor to Queen Catharine, mistress to Charles II. It was she who scratched poor Nell Gwyn's eyes, who sought with her pol­ished French wit to outshine the sharp, street bred repartee of the Covent-Gar­den orange girl, and who was routed in the attempt. Marched up a hill and then marched down again. Bordering the Mall, where the game of "palle malle" was played, are some fine old trees which, in their sapling days, looked down upon the Merry Mon­arch, and smiled to see the skittish coquetries of Nell Gwyn, and listened withal to the snappish diatribes in broken English of her jealous grace the Duchess of Portsmouth. Of such are the environments of the great clubs of London. There, in the afternoons, meet the great men of Eng­land, the cadets of lines of belted earls and greater soldiers, reading, gossiping, smoking, lazing away the hours 'twixt twilight and dinner. In an Imperial sense, the Carlton is the greatest of London clubs—the Union League Club, of Great Britain. It is most substantial in appearance, clothed in a pale gray. 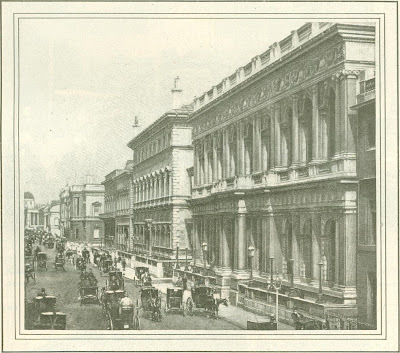 Owing its origin to the illustrious Duke of Wellington, it began in a small way in Charles Street, the thoroughfare from Haymarket into St. James' Square. At that time, 1831, this was a refuse pit, and what has since be­come Pall Mall petitioned against the introduction of gas into that region. 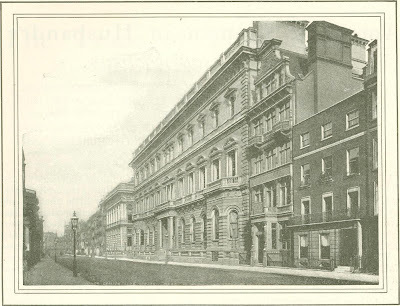 The Carlton Club was called after the prince regent’s well known house, and as soon as opportunity offered the members removed to Carlton Gardens and then developed into Pall Mall. 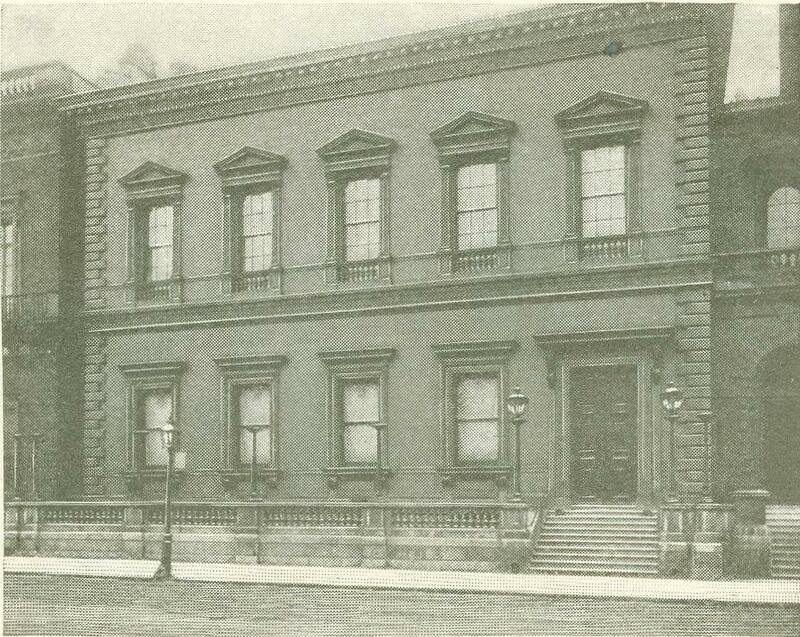 Sir Robert Smirke, R. A., who, with Barb', afterwards built the Reform Club, de­signed the present splendid edifice. In this club there still survives some of the political spirit of the Great Duke. It is severely Conservative. It is not only exclusively Tory, but, like the Con­servative Club, a kindred establishment, houses the very creme de la creme of Conservatism. Only Tories of wealth can reasonably be members. Its social ingredients, even where these are linked to the unchallenged right of every Con­servative member of the House of Commons to be a member, are above suspi­cion. The political committee has un­der its control a fund which may be used for assisting promising candidates fight­ing tough parliamentary seats. This is, in fact, the largest electioneering fund at the service of an English political party. The amount held in the, club treasury is, of course, the special secret of the committee, but it is said to be about five million dollars. 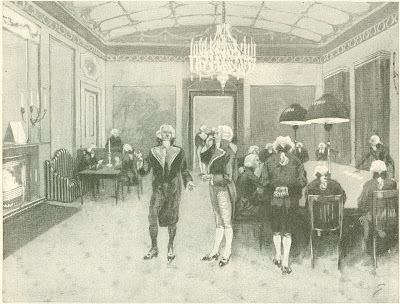 The kitchen of the club has been described as "spa­cious as a ballroom, kept in the finest order, and white as a young bride." Next in rank as a political rendezvous is the Reform Club, which occupies the adjoining block in Pall Mall. The Re­form has a distinctly political origin. As its name implies, it was established to promote parliamentary reform, and it actually did assist in carrying the first great reform act of 1832. Its sponsors were members of Parliament. 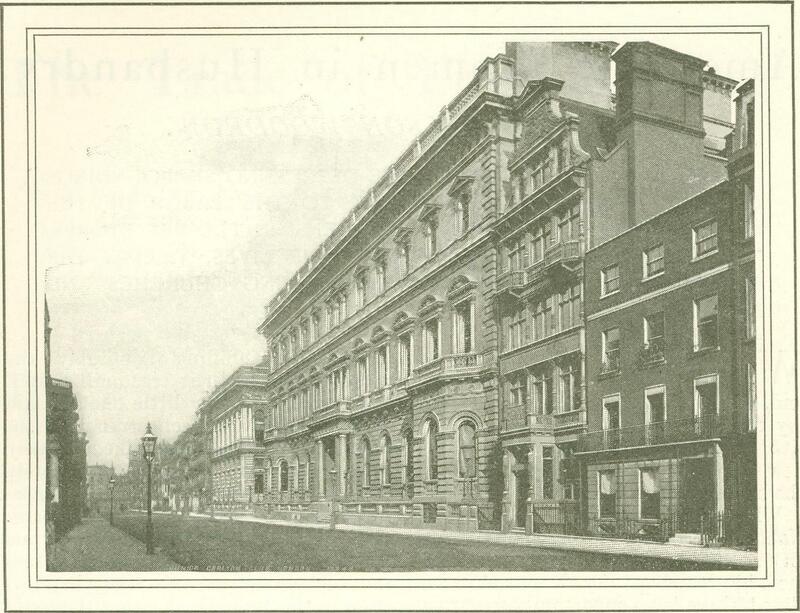 It did so well that in 1837 the Re­formers removed from their old place in Gwydyr House, Whitehall, hard by the spot where Charles Stuart lost his head, to the present aristocratic temple in Pall Mall. It became a great political resort, tempered by much hospitality. To show its superiority in this latter respect, the committee retained as chef M. Soyer at the salary of a cabinet minister. He added to his fame by the club breakfasts during the coronation of Queen Victo­ria, and when the dinner was given to Daniel O'Connell his soufflé a la Clon­tarf was the jest of the day as a bit of happy political satire. 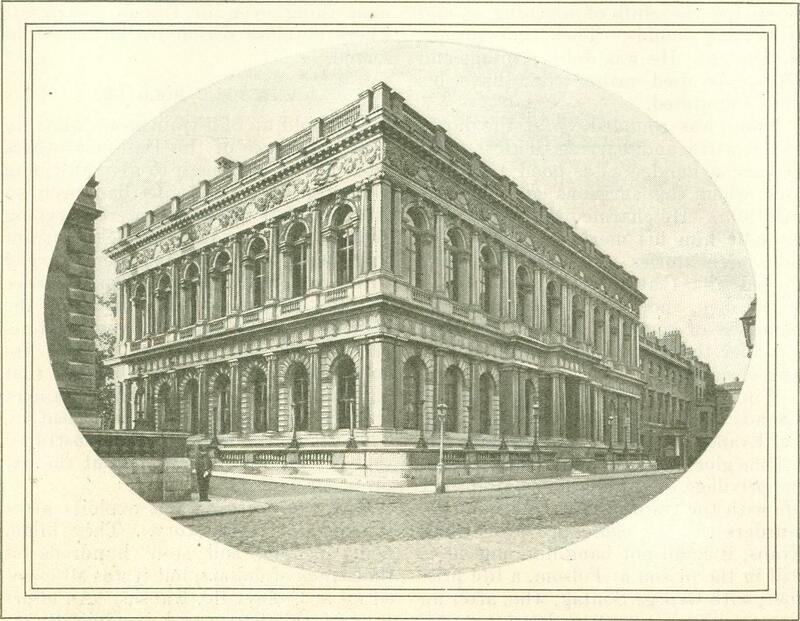 The Reform was the greatest club of its day, one of the wonders of new Lon­don and is still a delightful sanctuary. But though no longer a maker of poli­cies, it is nevertheless the meeting place of the distressed Liberal party when it has either to weep or to wash its linen in public. The Devonshire Club was founded on the initiative of a group of Liberals who resented the growing Toryism or the shrinking progressivism of the Reform­ers. Blackballing had come to be prac­ticed, upon the principle that the great club belonged exclusively to its existing members. Any exceptional quality was, therefore, sufficient to justify the use of the blackball—a speech during the elec­tion of a new member of Parliament, a business transaction, a display of su­perior brilliancy at last night's dinner table in some house where severe com­petition in conversation was the road to social ascendency. The Marquis of Hartington lent him­self to the new Liberalism, and the club was successfully established with the name and, in a sense, under the eaves of the ducal house which in the sixties and seventies embodied an invincible liber­alism. 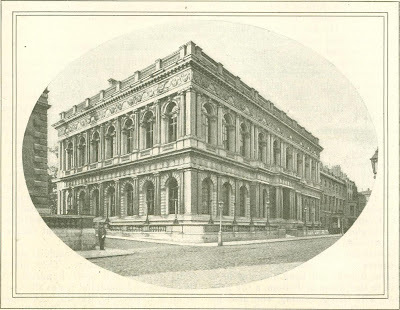 It came to be known as a chapel of ease to the Reform Club. Access to its princely rooms was easy, and it existed for a decade as the incarnation of the spirit of a progressive, virile, and active Liberalism. Still, although the Re­form Club felt the effect of, the compe­tition, friendly relations were maintain­ed between the two houses, and in those recurring intervals of domestic agony known as the annual cleaning time they received each other's members. It is, however, doubtful whether the Devonshire Club ever realized, even in the flush of its youth and promise, the impulses that brought it into ex­istence. It has not played any promi­nent part as a politi­cal rendezvous. I cannot recall a sin­gle meeting of the Liberal party having been held there. 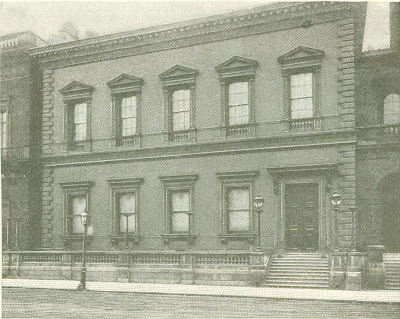 When Earl Gran­ville's mansion in Carlton House Ter­race, or Lord Ren­del's in Carlton Gar­dens, became the theater of the forma­tion of a new govern­ment, as they cer­tainly were in 1880 and 1892, ardent statesmen expecting to be summoned to office waited the call in the Reform Club—never in the Dev­onshire. 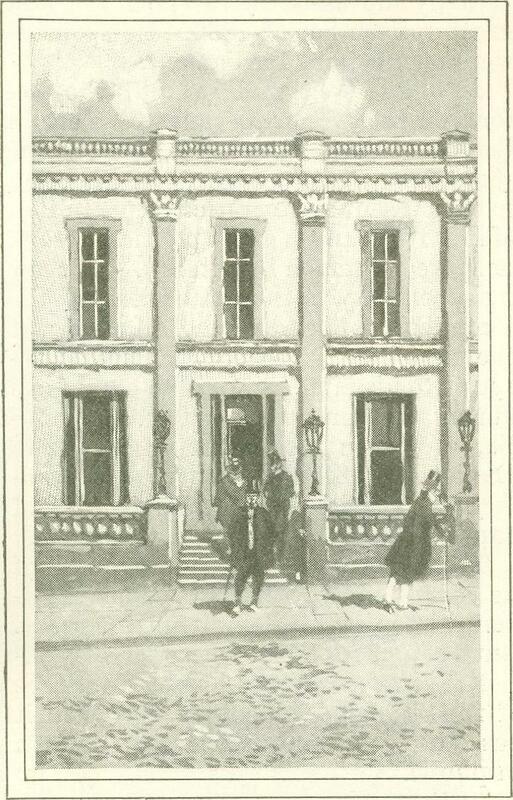 The Devonshire Club eventually be­came a great omnibus for the reception of every profession of life. It resembles today a splendid lunching restaurant. It suffered from the split on Home Rule which destroyed its last flickering claim to be regarded as the headquarters of vigorous Liberalism. Now it is as beau­tiful and luxurious as ever, yet enviously isolated. Its existence is bound up in the traditions of Crockford's. Crockford's, in the early part of the past century, was the most polished "hell" of its age. It was the resort of the bloods of the day. Here d'Orsay hazarded such remnants of fortune as he allowed to be left himself. Crockford was a speculative fishmonger of Cecil Street, Strand—then a line of fau­bourgs terminating with Northumber­land House. In these faubourgs dwelt many notable persons. 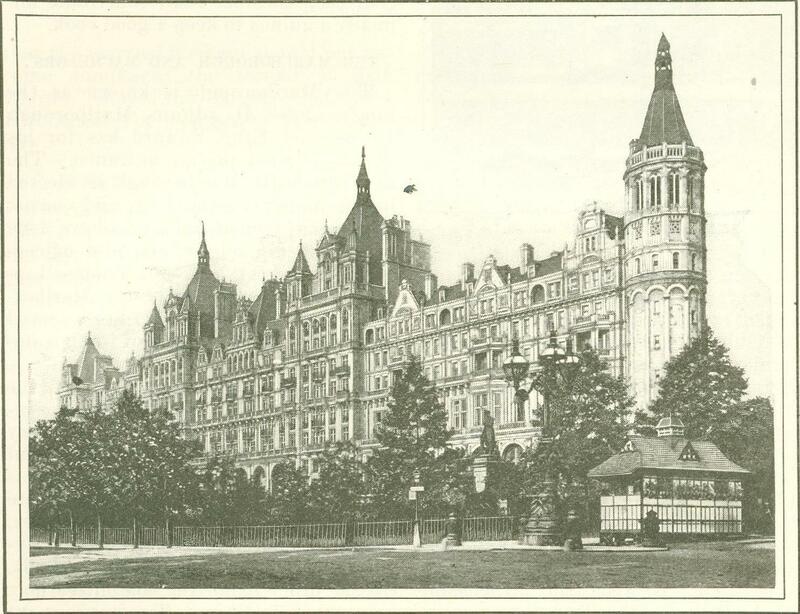 Today it is the center of London's hotel world. Crockford was a sport and a turfite, and he founded his club as a gambling and money lending venture. It was a gilded "hell," furnished in the heavy, somber style of the early Georges, with massive candelabra, and was hung with mirrors and ponderous "oils" in broad frames enriched with high relief figures of Rubens' women, grapes, and hideous goddesses. It was an age of three bottle men, whose sullen appetites were assist­ed by their heavy, unctuous, drowsy sur­roundings. How many young men of estate were ruined here is to be seen, perhaps, in the gaps in Burke's Peerage as well as in great but impoverished honors existing today. One night the Earl of Winchel­sea and Nottingham hazarded half his estates upon asingle throw of the dice box, and lost—but retained his temper. Crockford's, however, perished upon its own luxury. Its sins stifled it, and on the ground where this hideous center of folly stood, the stately, blameless Devon­shire stands today. Club cooks in those days could com­mand high prices. Crockford paid his chef, Ude, six thousand dollars a year. But just as a depraved appetite grows by what it feeds upon, Ude was haled to Bow Street one morning at the suit of Lord Queensberry and fined for unlaw­fully trafficking in "red game" during the close season. The headquarters of British Whig­gism is at Brooks's, in St. James' Street, a few doors from the Devonshire. Brooks's was closely identified with the great Liberal split over Gladstone's Home Rule bill. It was here indeed that the emeute was conceived and hatched. Originally, like Crockford's and Al­mack's, Brooks's was the resort of fash­ionable gamblers a century ago. It was speculative in the sense that it was raised by the man whose name it bears to make him an income. But he proved a failure. Hare wrote to George Selwyn, "We are all beggars at Brooks's," and its founder himself died in poverty in 1782. Yet its name is identified with such patrons as Burke, Horace Walpole, Gibbon, Sheridan, Garrick, and Wilberforce—most of them, however, needy. Here Charles James Fox displayed his passion for play. Slowly Brooks's crystallized into a political establishment and became the headquarters of the old Whig sect. Now it is the home of the more exclusive of the Liberal Unionists. 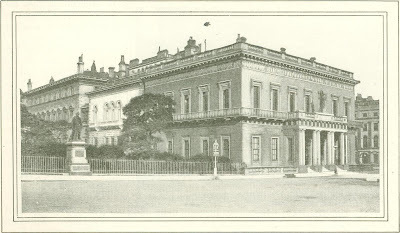 The Duke of Devonshire is a member, and it is prac­tically run by Lord James of Hereford; but Mr. Chamberlain rests satisfied with the Athenaeum and the Devonshire. At the head of the erudite clubs of London stands the Athenaeum, a mag­nificent temple dedicated in a sense to literature, the church, and the arts. Here bishops foregather with novelists, painters, and actors. Sir Henry Irving is a member of the Athenaeum, and the Archbishop of Canterbury—the afore-time vagabond and the primate of all England. The origin of the service club is found in practical economy more than in so­cial luxury. The long and costly war with Napoleon threw upon Lon­don a large num­ber of half pay officers of both branches of the service. Out of these doughty vet­erans was built the United Service Club. The Senior Uni­ted Service is to­day one of the best appointed estab­lishments in Clubland. It stands in Pall Mall at the corner of Water­loo Place, the Athenaeum being its vis-a-vis at the western cor­ner. Between the two stands the equestrian statue of the brilliant sol­dier, Lord Napier of Magdala. The Senior, as the club is called, was design­ed by Nash, and is the abode of lux­ury. Its rooms are upon an extensive scale, and upon its walls are portraits full length of Brit­ain's better known warriors from Wel­lington upwards or downwards. The most distinguished original member was Lord Lyne­doch, famous in the Peninsular War, who lived to see four corona­tions. He it was who, when a sub­altern, killed a footpad in Piccadilly. The best known paintings upon the walls of the Senior are Stanfield's "Battle of Trafalgar" and Robinson's portrait of the great Duke of Wellington. 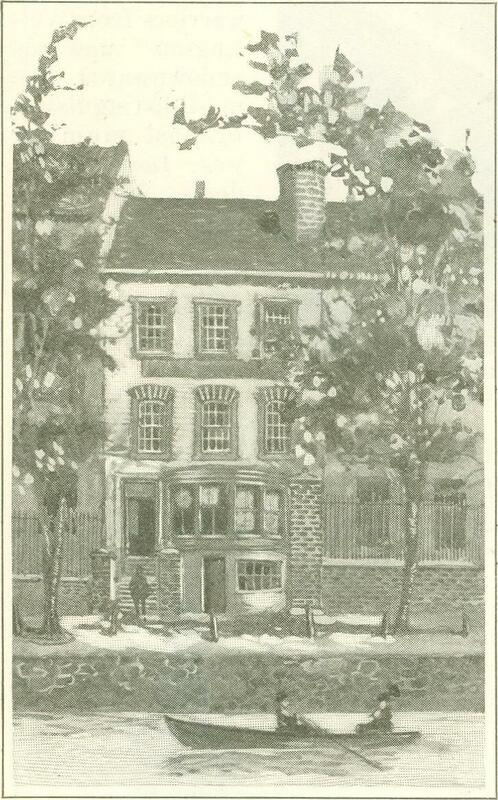 Later came the Army and Navy Club, known as "The Rag." This extraordi­nary title, which is even the telegraphic code address of the club, came from the name given to the Union Jack in the Crimea. Both services fought under the jack, and when the Army and Navy became the resort of officers who survived that war, the old euphemism chosen for the flag crystallized into a sobriquet for the club. There are several service "juniors," as there are several politi­cal "juniors." Wolseley, Roberts, Bul­ler, White, and Kitchener are, of course, members of the greater establishments. 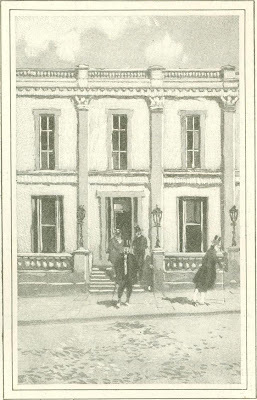 The most distinguished and exclusive of all the clubs is the Travellers, which stands—a plain, drab faced building, reached by a flight of uncompromising stone steps—between the Athenaeum and the Reform. The Travellers was es­tablished in 1814, and Prince Talleyrand ranked with the foreign members of the time. It may be taken as a sign of the untraveled habits of the period that, under the rules, no candidate should be eligible who had not journey­ed to a point distant five hundred miles from London. In the days of its found­ing, that represented a decided tribute to adventure. Talleyrand played a se­date game of whist at the Travellers, where dice and hazard of any kind were forbidden. White's is another of the exclusive clubs of London. 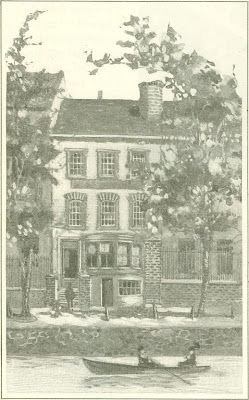 "White's Chocolate House" was famous in 1689, when it was contemporary with the "Kit-Kat," the "Cocoa Tree Club," and the "October Club." It was a period of gambling. "Zooks " and demireps sat in the cof­fee houses and appraised every young gentleman of estate fresh from home as a butcher appraised the yield in veal or mutton of a calf or a Southdown. White's was the center of activity. But White's has sown its wild oats, and is now famous for the elegance of its mem­bers and the high tone of its social en­tertainments. One of its rules provides. that each member shall contribute an­nually a guinea to keep a good cook. The Marlborough is known as the king's club. It adjoins Marlborough House, and King Edward has for his exclusive use a private entrance. The members of the Marlborough are elected by permission of the king, and consist of personal friends, men who have done something diplomatic, and also officers of the united services. Sir Thomas Lip­ton is now a member of the Marlbor­ough. The St. James', another reserved club, is almost the habitat of foreign am­bassadors. Among the exclusive clubs of the eccentric kind is the Bachelors'—the re­sort of the gilded youth. 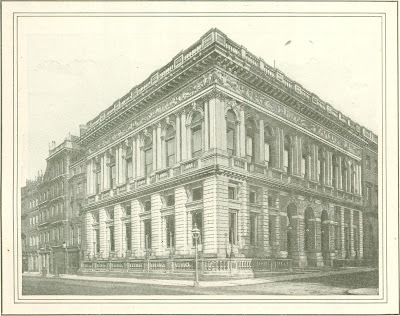 It is a very smart establishment in Piccadilly, and one of its crystallized eccentricities is that a member upon entering the state of matrimony ceases to be a member, though he may be reelected upon pay­ment of a fine of twenty five pounds. On the other hand, the committee may refuse to reelect him. Two versions are given of the spirit of this rule. One is that the married element should not be­come dominant; the second is that "bores" should thus be got rid of. Lord Kitchener is a member of the Bache­lors'. The number of all night clubs in St. James' is rapidly diminishing. Almost the last is the old Raleigh. After its great namesake, this club was typical of adventure, gallantry, and travel. Its members dined, played, drank, and went home with the morning milk. One member, returning from India, reached the Raleigh at seven o'clock in the morn­ing. Among peculiar names given to well-known clubs, none is more apt than that bestowed upon the aristocratic Turf Club in Piccadilly. Tell any cabby to take you to the "In and Out Club" and you will be landed at the Turf. Address your letters and telegrams so and they will be delivered. The club house stands back from the street and has two gates in the front wall. On one of them, for the guidance of drivers, is painted the word "In"; on the other "Out." Hence the sobriquet. Such is the composition of London Clubland. Elsewhere are other clubs, literary, theatrical, and bohemian, but their habitat is beyond the confines of Clubland. 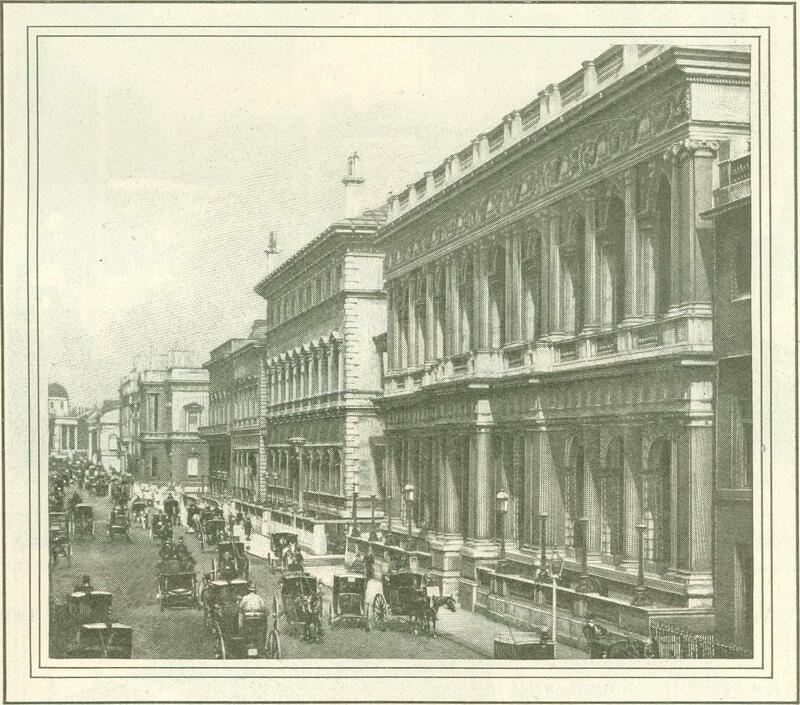 They are housed in Adelphi, along the Strand, bordering Covent Garden and Leicester Square. Within them is an interest, but not properly that of Clubland. It is solely an eccen­tric interest. From Munsey’s Magazine – February 1902.